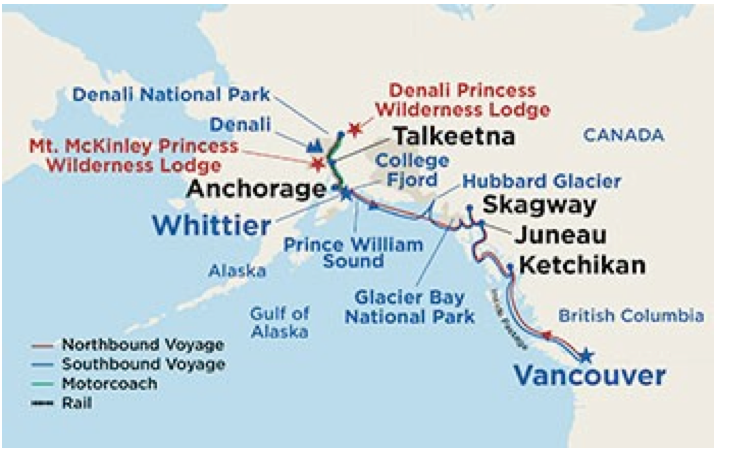 Seven Nights on the "Golden Princess"
We are so excited about our 2019 Alaskan Inside Passage and Denali Explorer Adventure to the "Land of the Midnight Sun". It's been several years since we've made this journey. It always breathtaking and awe inspiring every time we see those magnificent glaciers! Set sail for seven nights on the Golden Princess traveling Northbound from Vancouver, British Columbia to Whittier, Alaska. 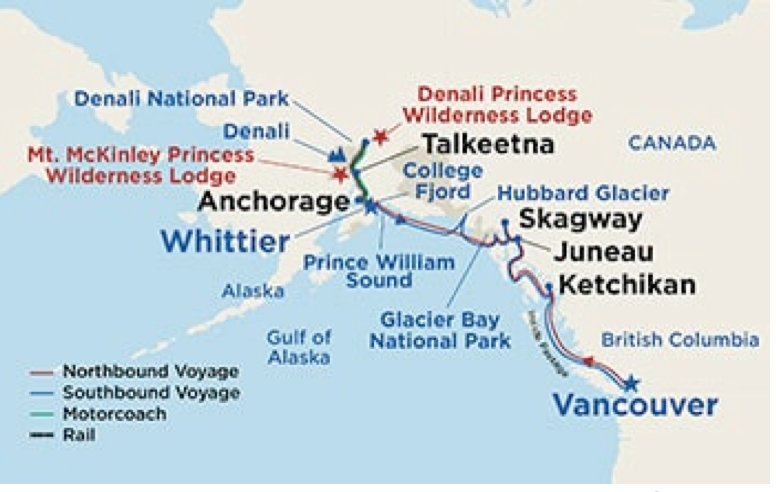 Our Glacier Bay tour will include Ports of Call in Ketchikan, Juneau, Skagway and Whittier. We'll board the "Direct to the Wilderness" train to Denali National Park where we'll spend two nights. Talkeetna, Mount McKinley and Anchorage are also all part of this delightful cruise and land package. Originally, you may have noticed where we made plans to cruise on Norwegian Cruise Lines. We made a change to go with Princess for a variety of reasons. We prefer sailing northbound over southbound and Princess is able to offer us the exact dates and route we are looking for. The service, food and overall quality on a Princess Cruise is hard to beat. So, get ready for a trip of a lifetime as the Golden Princess awaits our arrival in July 2019 for our Glacier Bay - Alaskan Inside Passage and Denali Explorer. Round-trip shuttle transfers from Northeast and Central Minnesota to Minneapolis plus pre-night lodging near the airport. Two nights lodging in Vancouver, British Columbia to include a private charter and guide for a full day touring on Vancouver Island (Butchart Gardens) and an area city tour the following day. Additional land portion meal plan after the cruise plus tips for those meals. (SEVEN extra meals). On board ship gratuities of $13.50 per person per day while cruising. All Cabins are BALCONY - BB Category - MID SHIP - BAJA DECK for Double/Single (Triples & Quads are available - though limited - on a different deck) We only have a total of 16 cabins held. REGISTER by November 30, 2018 and SAVE $100 per person discount! We realize the price of this tour only get higher and higher every time we write it. BUT it's Alaska! There's only a short window of time to travel to this amazing destination when the weather is good. Go while you can enjoy the journey. It's worth every penny! Princess Cruises will begin to pull cabins in January 2019 if we have used them... so don't wait too long to register. Those cabins could be gone! We certainly hope you'll consider coming with Happy Trails Tours on this amazing Alaskan Adventure. We'll save a seat for you! Pre- night lodging near the airport. We'll announce the name of the pre-night hotel closer to the time of departure. Depending on the number of people at each stop, our Alaska tours generally include transfers to the Minneapolis airport from the following locations; Sartell (AmericInn); Little Falls (Walmart); Baxter (Walmart); Grand Rapids (Super Eight); Hibbing (Park Hotel) Virginia (Village Inn); Eveleth (Super 8); Duluth (Perkins Miller Mall) and Cloquet (Perkins). Oftentimes, folks will meet us at the airport if they live in or around the Twin Cities. Stay tuned for further information on this. You need U.S. Passports for this tour! Our airline schedules will be announced about 3 months prior to departure or earlier. Once we get through the airport security, customs, gather our suitcases, we'll meet our airport transfer and settle in to the beautiful Georgian Court Hotel in the heart of downtown Vancouver, BC. We'll be here for 2 nights. Once checked in...you have the freedom to explore the area at your leisure. Shop, dining, museums and the famous Robson Street are all within walking distance of this lovely boutique property. After a full breakfast this morning @ 6 am, you'll enjoy one of Vancouver, BC most popular full day narrated tours to Vancouver Island. It'll pick us up at the hotel at 7:15 am and bring us to the boat dock, home to "BC Ferries". Here we'll take a 95 minute cruise through the marine wonderland of the Gulf Islands. Once docked at Swartz Bay, our tour will continue to the world-famous Butchart Gardens with their 50-acre display of magnificent foliage. After spending 2 hours at the Gardens, we travel to historic downtown Victoria for a Narrated City Tour. We'll wind our way through quaint Chinatown and Inner Harbour, the Empress Hotel, the Royal BC Museum and more. We've even tucked a little time in for lunch and shopping (1 1/2 hours). We'll re-board our motor coach and travel to the boat dock and return to the mainland around 7:45 pm. (Note: You can get food & drinks on board the ferry). Another breakfast is included this morning at the hotel @ 7 am before checking out of our hotel and beginning the next phase of our Alaskan Tour. We've planned a wonderful Vancouver City Tour to begin at 8:45 am from the hotel. You'll hear the stories and history of the people of Vancouver as well as visit Queen Elizabeth Park and Stanley Park. We'll drive by Gastown, Chinatown, Robson Street, English Bay and Granville Island before ending our tour at 1 pm @ Canada Place Pier where the lovely Golden Princess is docked. We'll begin the process of checking in at the pier for our seven night Alaskan Inside Passage Cruise. Once this is completed, you are free to get lunch on board the cruise ship as rooms are not always ready until about 2-3 pm. Your Inside Passage Cruise departs in the late afternoon. Several Restaurant Options - We are booked with EARLY DINING @ 6 PM. The Golden Princess also offers several formal dining rooms and several casual eateries on board. Experience both Southeast Alaska's rich native heritage and rough-and-tumble pioneering side. We encourage you to sign up for "Shore Excursions" right on board the cruise ship for tours of places like Ketchikan (your 1st Port of Call). We'll help steer you in the right direction if you wish to take a narrated city tour that would include the history, totem poles and more. Or if you prefer, you can simply enjoy all ports of call by stepping off the ship and exploring as per your own agenda. As we sail northbound thru the Inside Passage, we'll pass through awe-inspiring scenery before arriving to Juneau. This 26 miles of mind-blowing scenery twists and turns ​thru the narrow passage to include rugged granite cliffs, rising straight from the water's edge, laced with waterfalls. Juneau, the 1880 mining camp became the territorial capital in 1906 when the government was transferred from Sitka. It sits at the base of Mt Juneau and is surrounded by salt water. There are great tours that may interest you while in Juneau. We'll continue our journey northward through the Inside Passage. We'll see Mendenhall Glacier, a 5000 square-mile Juneau Ice fields that is one of the largest ice fields on the continent. ​Good Morning! While the cruise ship was leisurely sailing north, you'll rise and shine this morning in Skagway. In a single year from 1896 to 1897, this remote town along the Inside Passage grew from a few tents to a city of 20,000 gold seekers. Today, travelers come in search of other riches – to experience yesteryear along Skagway's charming boardwalk lined with buildings that replicate those Gold Rush days. We'll sail along Glacier Bay National Park and Preserve, a United Nations World Heritage Site. Comprised of 3.3 million acres of natural wonders, it is home to magnificent glaciers, snow-capped mountains and abundant birds and wildlife. Have your camera ready! It is a spectacular site. Today we'll sail along College Fjord. Get up close and personal with the gigantic College Fjord Glacier (a collection of many glaciers. Today includes a very scenic cruise at sea among the glaciers. Now the land portion begins! We'll board a chartered motor coach and travel to the Train Depot in Whittier. We'll board the "Direct to the Wilderness" Train to Denali National Park. We'll spend our 1st night on land while at the Princess Wilderness Lodge in Denali NP. We'll get checked in to our lovely property where the rest of your day may be spent at your leisure in the resort, hike on the trails or enjoy the swimming pool. We're in a great location where the rest of the day may be spent at leisure. Our second day here brings us deep into Denali National Park for a Natural History Tour. This informative tour includes a visit to the Denali National Park & Preserve where you'll enjoy an award-winning film, abundant wildlife and historical sites. This tour lasts about 5 hours allowing the remainder of the day with time to enjoy other activities as per your own agenda. Settle in for your 2nd night at the Princess Wilderness Lodge. Travel to Anchorage, Alaska! Again, enjoy beautiful scenery along our way. Our hotel is the lovely Hotel Captain Cook, located in Anchorage's historic district ​Anchorage, aka "City of Flowers", is Alaska's largest city offering plenty of restaurants & shopping within walking distance of our hotel. ​Enjoy a leisure morning before boarding your chartered motor coach for your airport transfer. We'll arrive to the Anchorage Airport begin the check in process for our flight home. Once we clear through customs with luggage gathered, we'll board our local motor coach transfer and journey home with fond memories of our trip to beautiful Alaska. We generally use Delta Airlines. Princess Cruise Lines can pull any allotted cabins blocked at any time once the ship begins to sell out. This may affect the availability of the tour as well as the cost if this happens. 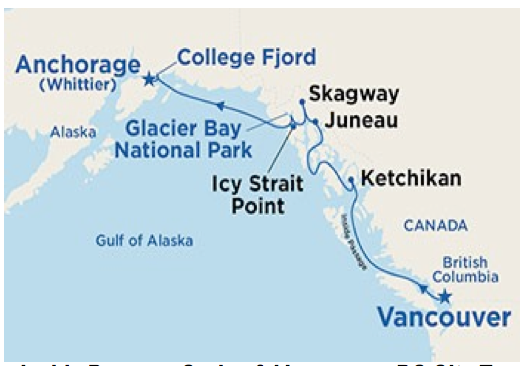 If you want to sail with Happy Trails Tours on this beautiful Alaska cruise in 2019, call ASAP and get your registration deposit made before they begin recalling cabin space. Deposits: $600.00 per person is due with registration. Final Payment Due Date: March 16, 2019. We accept checks, money orders, bank drafts and credit cards for modes of payment. Deadline Date to Cancel: March 15, 2019 (Must be in writing). Maximum Number: We only have 34 airline tickets and 16 cabins on the ship reserved. Once those are sold out, cabins are sold at the current rate. We cannot guarantee availability. Reservations are accepted on a first-come, first-served basis. Minimum Number: We must meet a minimum of 30 by April 1, 2019 or the tour may have to be canceled. Any monies you have paid to Happy Trails Tours are fully refundable if Happy Trails cancels the tour due to lack of participation, including insurance. Cancellation Policy / Refunds/ Travel Insurance: Happy Trails Tour Companies have penalties different from cruise and airline. This is why we offer the travel protection insurance at an additional fee. Travel Guard International covers pre-existing conditions, trip interruptions, delays, last-minute cancelations due to emergency illness, primary medical insurance and more when purchased within 12 days of your initial down payment. Be sure to read through the inclusions of the travel insurance brochure to see what the policy covers. Ask for a brochure if one is not included. Premiums vary depending whether you are a double or a single traveler and what your age is at the time you purchase the insurance. Claims may be submitted for refunds provided the reason for cancelation falls under the policy coverage. Happy Trails Tours is happy to assist you with any questions or concerns you may have about insurance. Medications: Do not pack them in your suitcase. Always carry them on your person. Bring a list along that shows what medications you are taking (especially if you transfer them into medication dispensers other than the original bottles). Passports: You must have a current U.S. passport with an expiration date of February 2020 or later. The number and expiration date is required on your registration form. There is no refund if you are denied boarding due to an expired passport (or no passport!). Shore Excursions: There are many shore excursions offered at the ports of call and throughout the land portion of this tour.. We recommend waiting to get on board the ship so that you can discuss in detail with Princess Shore Excursion team. Airlines: We must have your full legal name as it appears on your government-issued Passport. We need your date of birth and gender. If you have a Delta Sky Mile number we will submit it for you. Once names are submitted, we will be given seat locations on the plane. We will do whatever possible to honor any special requests for seat location. All seats are in coach class. Airline rewards cannot be used for group reservations nor will they allow upgrades to 1st class. Also, the airlines will charge a fee to change a name once names have been submitted. Please note that fuel surcharges can sometimes occur with both the airlines and the cruise line. We are not sure yet what airline we'll use but it's very likely Delta Airlines.